Regular readers will remember the case of former Dundee City Council employee Mark Conway who stole over £1 million from Dundee City Council. Monday evening's meeting of the City Council dealt with a report produced by the Accounts Commission on this. This is a report which every councillor and every citizen of Dundee should be very very concerned about. As a councillor I need to be able to trust the advice that I am given by officers. I need to know that financial statements are accurate. The report by the Accounts Commission demonstrates that this has not always been the case. As councillors we need reassurance from officers that there will be no repeat of this. We need reassurance that this cannot happen again. We also need to know why auditors did not pick this up. We also need a reassurance that council cuts did not contribute to this and allow one member of staff to accumulate a number of permissions and checks and balances were not in place. The report points out that the individual concerned built up lots of responsibility over the years and was one of very few individuals who understood the systems. The lack of segregation of duties allowed him to produce fraudulent invoices, pay them and then hide the evidence. Despite strenuous denials from officers I find it hard to believe that the cuts which have led to fewer and fewer people working for the council did not contribute to this fraud. At the Scrutiny Committee I proposed that the committee went further and wrote to the bank and building society concerned and the Treasury as well as the Gambling Commission and the Department of Culture, Media and Sport. To say that I am disappointed with the responses would be an understatement. We expect regulators to assist us. In this case I feel that we did not get the protection that we could have expected from the banks, building societies, Financial Conduct Authority and the Treasury. Neither did we get protection from the gambling firm William Hill, the Gambling Commission or DCMS. In these times of austerity imposed on Dundee City Council by the UK and Scottish Governments why did these organisations not help us through their regulatory powers? With regard to gambling I think that we should have a look at the support which the council gives and supports across the city to problem gamblers. It strikes me that the gambling industry looks upon the occasional fine or ex-gratia payment as part of the cost of doing business. Perhaps we should be stricter, perhaps we should question whether William Hill is a fit and proper organisation to hold a licence within the city. I will certainly be making the case for more regulation of gambling. What we need to know is that lessons have been learnt and officers have taken all appropriate actions to protect the public purse in the future. I've called for the Scottish Fire and Rescue Service to protect fire stations in Dundee. The Scottish Fire and Rescue Service (SFRS) arecurrently consulting on their future. The consultation contains references to changing the fire station footprint. Dundee City Council was due to decide on its response to the consultation last night but in light of the detailed amendments which I put forward they have postponed the decision until 14 May. The Scottish Fire and Rescue Service consultation is incredibly short on detail and full of leading phrases. Who could be opposed to firefighters being given modern equipment to do their jobs, for example. Worryingly though much of the consultation appears to be cover for cuts. The headline issue is an apparent 20% pay rise for firefighters but there would be fewer firefighters and they would be doing an awful lot more than they do today. There are suggestions that firefighters should respond to medical emergencies. That is fine but it should be additional to the resources available at the moment through the Scottish Ambulance Service and the NHS not instead of it. Most worryingly the document contains references to ‘reviewing’ the fire station footprint across Scotland. 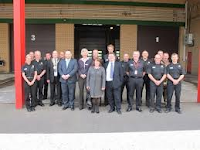 The proposal put forward by the SNP Administration said that it was broadly supportive of proposals put forward by SFRS. I was worried that this would be interpreted as support for changes to fire stations in Dundee. 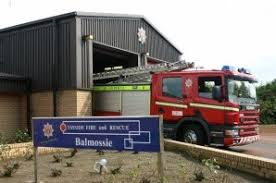 On Tayside Fire and Rescue Board I was proud to have played a part, with others, in stopping plans to downgrade Balmossie Fire Station not once but twice. 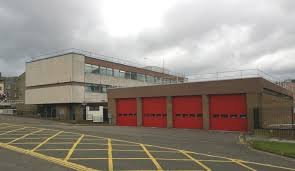 I believe that Dundee City Council must make clear its opposition to any changes to fire stations in Dundee. That is what I will be looking for when this item comes back to councillors. 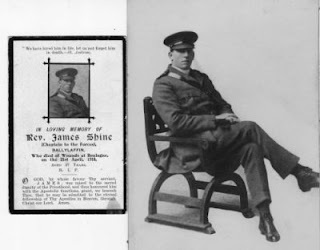 On Sunday I was pleased to be able to join the congregation at St Joseph's Church in Wilkie's Lane as they marked the one hundredth anniversary of the death of Fr James Shine. Fr Shine had served as one of the priests at St Joseph's in 1914 and 1915. Fr Shine was born in County Tipperary and was a priest of the Irish Diocese of Waterford and Lismore on loan to the Diocese of Dunkeld working in Dundee at the time he joined up. He died in Boulogne on 21st April 1918 from wounds received whilst ministering to soldiers in his role as a British Army chaplain in World War I.
Fr Shine's story is one that should be more widely known. Many people will be surprised to hear about this Irishman who volunteered to serve in the British forces during this turbulent time in relations between Ireland and Britain. Whilst Fr Shine died 100 years ago I think that we should remember the sacrifice that he made. We should also look at that War Memorial at St Joseph's and the names of all those men who lived in the streets around the West End and resolve to do all we can to say never again. As some readers will know I have studied the impact of the Irish on Dundee. In the course of that I was lucky enough to meet Fr Shine's great-nephew, Sean Murphy, who has done a lot to promote the memory of Fr Shine. I would also like to draw attention to the excellent work done by the Great War Dundee Group in looking at all aspects of the First World War in Dundee.